Voice for Disability (formerly West Sussex Association for Disabled People) and latterly charity Independent Lives ran a two year oral history project called ‘Speaking up for Disability’. This project was funded by Heritage Lottery Fund. ‘Speaking up for Disability’ mapped out oral histories and heritage of a diverse group of disabled people from across West Sussex. Uncovering attitudes towards disability, how the experiences of disabled people in West Sussex have changed since the 1940s when Voice for Disability was set up, it promoted the contribution disabled people have made to society in West Sussex. This project is now finished. You can view a presentation about it: here. And read more about it here. Planning and coordinating a community archive and heritage website and training volunteers in its construction with support from Brighton based Community Sites. The website has been chosen by the British Library for archival through their Web Archiving Programme which collects, makes accessible and preserves web resources of scholarly and cultural importance from the UK domain. 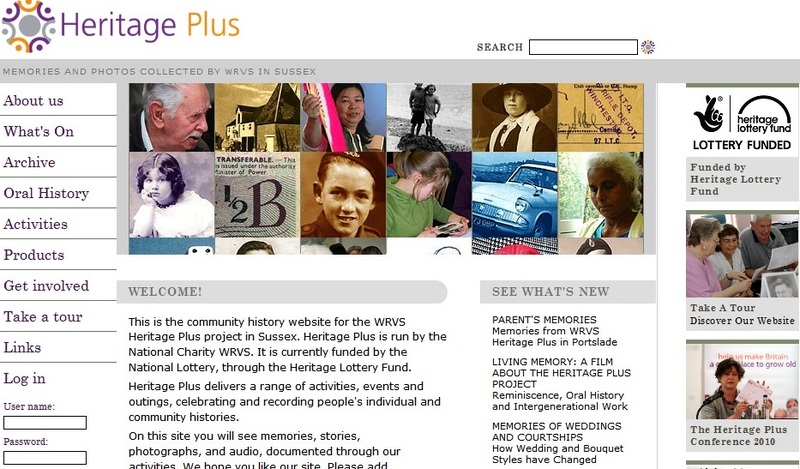 It is a community history website for the WRVS Heritage Plus project in Sussex. Heritage Plus is run by the national charity WRVS. It is currently funded by the National Lottery, through the Heritage Lottery Fund. Heritage Plus delivers a range of activities, events and outings, celebrating and recording people’s individual and community histories.